I have four rocks on my desk. They are talismans, gifts, wishes, and reminders. From my son, a quartz crystal that shows clarity, but always has an underlying complexity. From Alaska a green soapstone shard that reminds me that even in the harshest places, there is softness. A red rock from Sedona, Arizona that suggests that time is measured by the earth on a scale that is oftentimes incomprehensible to me. And a gray, shiny oval rock that has the word "Within" carved into it that reminds where all the answers are hidden, no matter how difficult the questions. Multi-instrumentalist Ann Licater harnesses the power of breath and the depth of her heart on her new Native American flute and contemporary album called Invitation from Within. This extremely meditative album opens locked doors, shakes away cobwebs, and crumbles the walls of uncertainty in your mind. I have never been on a vision quest, but if I did, I know I would hear this music playing in my soul. The title tune, Invitation from Within sounded very delicate to me. Not dainty, but fragile. The tune opens with a single note from a steel tongue drum that resonates like a ripple in a pond, touching everything and having an oblique effect on the music. The flute rises out of the depths and fills every available emptiness like a natural panacea. The medicine is called hope. Cradle of Light/ features the horn of Jeff Oster, who turned a funky apparatus called the flugelhorn into a major lead instrument. Here, his muted trumpet is a call to the dawn, beckoning her to rise and allows us to bask in her beauty and warmth. Ann’s flute is the prayer that reinforces that request. As I listened to this, the golden light from the sun appeared over Thunderhead Mountain in the distance. It changed the way I think about sunrise. Although I am not well versed in Eastern philosophies, it seems to me that Luminous Awakening is perhaps a metaphor for enlightenment. What is not surprising is that Ann has taken a westerly direction to journey east. It does not matter whether your God comes from the Earth and Sky or from a Bhodi tree, what matters is that the concepts of goodness and love prevail. It turned out that Dream Journey was my favorite on the album. This song has layers and layers of nascent beauty. Steel tongue drum, flute, more flute, and passionate bass combine on a piece that gives the feeling of floating in an unseen universe, a passenger on a trip of never-ending possibilities. There was obviously a lot of thought given to balancing the high-pitched lead of the flute with the throatiness of the bass. It was a westerner’s version of a magic carpet ride. What happens when we find all the answers and finally come to peace with our world and ourselves? Those questions can only be answered by our hearts. Return to Grace, with its sweet, gentle, drifting melody offers a gentle celebration for not really achieving that goal, but for trying, for choosing the path. It is a very big step to know yourself. 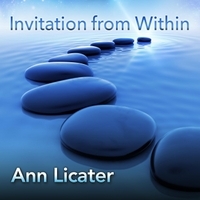 Ann Licater's new album, Invitation from Within, takes my rock collection and converts my intangible theories into music that is grasped by not only the senses, but the heart as well. Her melodious flute playing on this twelve-track album is superlative and, as always, produces a zone conducive to healing and contemplation. She embodies the quiet serenity personified by the Native American cedar flute as well as performs with haunting precision on the many forms of the silver flute. Joining Ann are talents familiar to all of us including Jeff Oster on trumpet, Peter Phippen on bass, Lis Addison on vocals, Ivar Lunde on piano, Kathleen Farrell on Crystal bowls and David DiLullo and Jason Introwitz on percussion. Special kudos to Peter Phippen whose bass plays a major role, a counter balance if you will, on the recording. Highly recommended.